Pick you up from your hotel in Shanghai by our private driver at 5:00 AM. Transfer to airport and fly to Beijing. Upon your arrival, pick you up from Beijing airport and drive to Forbidden City. 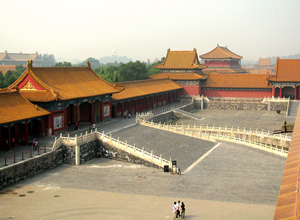 First, you will see the large Tiananmen Square and witness the nearby majestic imperial palace Forbidden City. Then transfer to Great Wall. You will visit Mutianyu Section. The section of Great Wall is less crowed and boasts more spectacular section. After the tour, transferred to airport and fly back to Shanghai. Shanghai airport pickup and hotel transfer. Hi, I’m visiting Shanghai in May and want to do a day trip to Beijing. I’m a single traveller but am happy to join a group tour,to keep costs low! I don’t require a one-to-one private tour. How much would the day trip cost please.? Thanks. do you have the same kind of tour but visiting only the great wall and hiking on it. I am interested in Beijing 1 Day Tour. We are a Family of 3 including a Child of 5. please let me know the Price as soon as possible. We plan to travel on 4th September Morning. I am interested in a Beijing 1 day tour from Shanghai in the middle in 23 and 24 of Nov. I am a single traveler and am happy to join a group. How much would this cost? Thank you. I am interested in a Beijing 1 day tour from Shanghái on nov 7. I am a single traveler and am happy to join a group. How much it will cost? Thank you. Sorry, this is a private tour. No join-in group tour available. I’m going to fly for Shanghai in 21st of March, and stay for 2nights. I’m interested in your day tour from Shanghai to Beijing. Would you tell me the cost per person. I would appreciated for your attention and reply. I’m going to fly for Shanghai, and stay for 2nights from 21st of March. I’m interested in your day tour to visit Great Wall of China. Would you tell me the cost of your 1-Day Beijing Tour from Shanghai(BTG-235)? We sent an email to you, please check. Thanks!